Plot - Zhang Hui try her best to change the mind set of Xiao Gong toward her as Xiao Gong think that Zhang Hui is just friend of his. Xiao Gong is a classmate of Zhang Hui and she has a crush on him. Family pressure forces him to focus on his studies than relationships and gives a role of “Just-Friends” to Zhang Hui. But Zhang Hui is the one who doesn’t want top give up easily, so after graduation she starting looking work in Shanghai in order to stay close to Xiao Gong. As time passes and when Xiao Gong came from his business trip he has a new girlfriend with him named Bei Bei. But Zhang Hui is the one who doesn’t want to give up very soon so she start taking help from her college classmate and her group of friends that have mastered the art of flirting. Zhang Hui appearance, attitude and skills of seduction improve dramatically and Xiao Gong starts noticing her and their relationship level goes up from being just friends. where on the other hand Bei Bei is trying to maintain her girlfriend status. 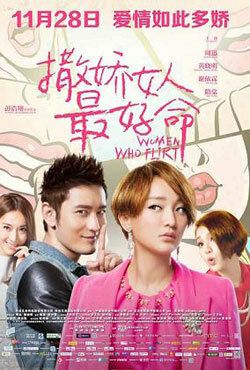 Awards & Nominations Won by "Women Who Flirt Movie"
Box Office Earning of "Women Who Flirt"